Reflections on Challenges Buddy College Programme is a series of self evaluation and sharing by the youth who participated in disability advocacy activities with Challenges Foundation. 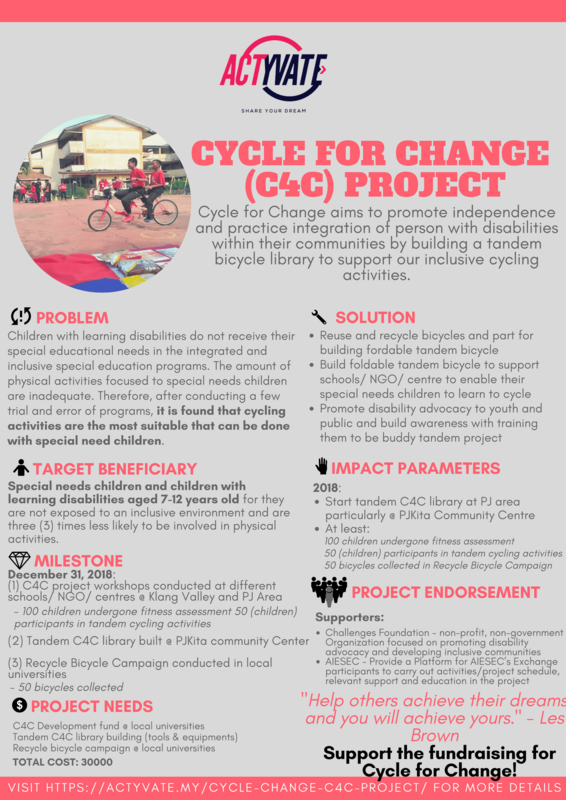 In this compilation, we share the thoughts of three youth namely Aimi Aqilah, Sabrina Amin and Nadhrah Athirah binti Johan, who participated in a social engagement project under Challenges Foundation in April 2018. The night before the first session with the special students of SMK Bandar Sunway was nerve-wrecking. I was so nervous to meet the students mainly because it was the first ever session with them, Therefore, there was a nagging feeling of wanting to set a good first impression. When the day itself came, the nervousness from the day before just somehow seeped away the moment I entered through the school gates. The school atmosphere gave me a nostalgic feeling and I became excited to teach the students what I knew about drama. At first, I was expecting the students to be wild and hard to control. Besides, I also thought that they won’t give us any cooperation at all. Even with all these perceptions I had in mind, I was still very excited to meet the students. When we started our ice breaking session with them, all my perceptions turned out to be false! They were all so outspoken and cooperated well. They were always smiling and answering us, even though the answers were wrong and not what we were looking for but at least they tried their best. The thing that touched my heart the most was this Chinese boy who has speech impairment. From my memory, I think his name is Zhue Lin. There was a narrator’s role that required the actor to speak loudly and clearly and he volunteered for it! Even though he couldn’t say the words properly, he still tried his best. For me, that is one of the most heart touching moments during the first session of drama class with the special students. During my experience being the photographer in the Drama team, we had to do drama activities and do a play for the kids and they have to showcase it during an event. Much pressure but we had to do it for the kid’s sake. I had fun capturing the cute moments of my friends with the kids. Their laughter and smiles really made my day and their participation also. I thought the kids were going to be young special needs children but when I came some of them were actually taller than me. And their age ranged from 16 to 18 year olds. Much older than I expected. But nonetheless, they were very cooperative and sweet children. Though i didn’t have to interact with the kids but I took the initiative to communicate and bond with them even with the students that aren’t suppose to be in the class. I had so much fun seeing the kids wanting and very enthusiastic to learn about the drama and participate very actively in the activities. I hope that we as a team can continue communicate and bond more with the children and i hope that the misconceptions of them being hard to handle or very uncooperative would dissolve as the children we worked with were the total opposite and i almost teared up when they actually were helping each other because they know each other weaknesses and this shows how much stronger and more patient they are than us. I learned that these children though they are slow learners but they have the biggest hearts. Being an impatient person, this opens up my mind to be more patient with these kids as they too are struggling with themselves and very patient with themselves. I hope that we can continue our bond with these kids until after we finish the programme. I was actually excited but nervous at the same time thinking about meeting the special kids in SMK Bandar Sunway, as I never interact with special people before in my life. But my nervousness died instantly after I met them. There were 12 students who joined our programme, 4 girls and 8 boys. Most of them could speak well, except that they are hyper at times, obviously because of ADHD (Attention deficit hyperactivity disorder). Nevertheless, I was happy to get to know them better. 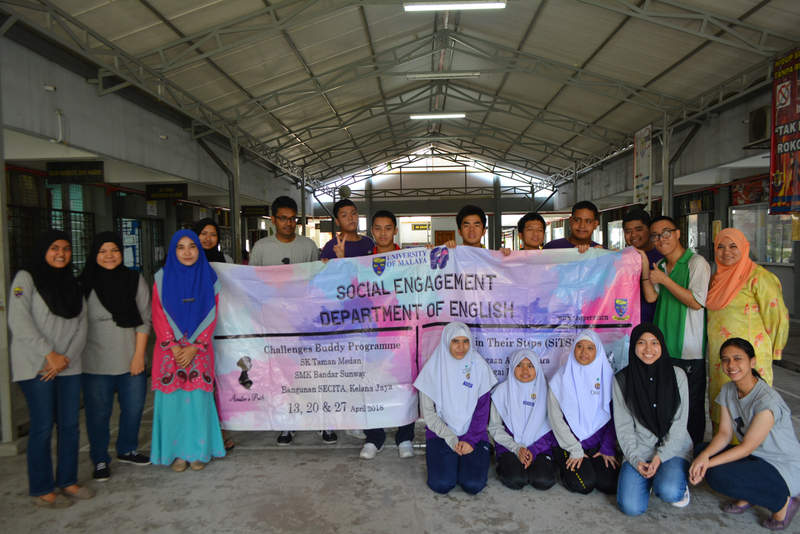 My expectation towards them is that it would be difficult for us to control and teach them English at the same time, but contradictory to my thoughts, I was actually surprised and amazed because most of them are intelligent and they have lots of ideas to talked about! There was little to no communication problem, so it was not that hard for us to help them out. It was just their shyness that we need to get rid of so that they would be more confident to perform for the drama. However, the moment I knew that I have to teach special needs students in that school, I thought only of dyslexics, ADD’s and ADHD’s. Little did I know that there was also an autistic girl joining the group. It was a misconception that I should get rid of before I came here because there should be a platform for anyone with any condition who wants to learn. Even so, the girl was willing to cooperate with us although there was one time she felt like she did not want to do anything (maybe a little meltdown), so we talked to her about topics other than English drama to calm her down and make her more comfortable. Thank God, she became interested again to join us. It was a fun day indeed to spend time with those special kids. I am looking forward to join this kind of activity again in the future.